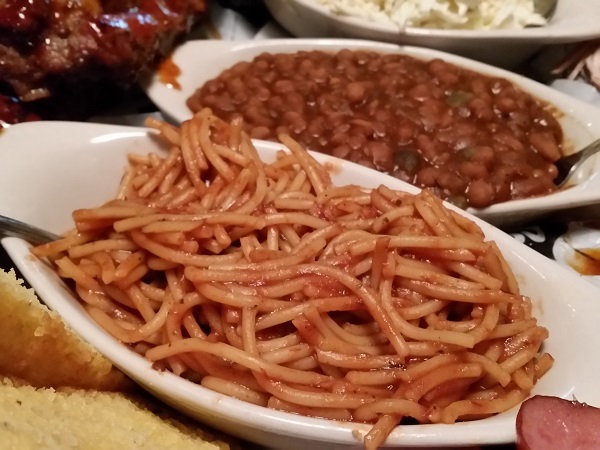 Memphis BBQ Company, Dunwoody GA – Marie, Let's Eat! 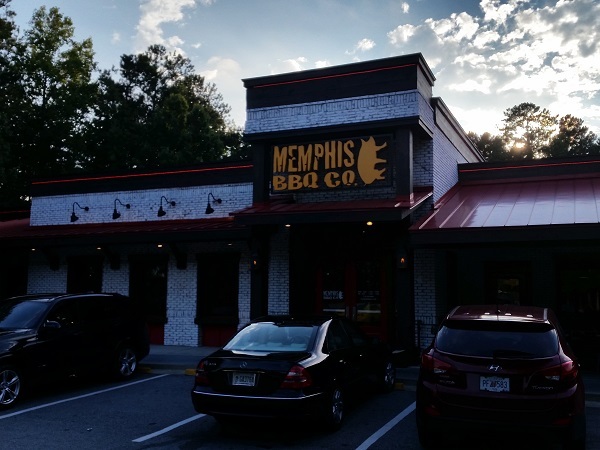 Last month, Marie and I were invited to visit Memphis BBQ Company, which opened last year in a great big space in Dunwoody that had previously been the home of a British-themed pub called Firkin & Gryphon, and, for many years before that, a Smokey Bones. It looks like too large a space for a barbecue restaurant in Atlanta. Acknowledging that Jim ‘n Nick’s has done pretty well here, quite a few other large-store chains, including Famous Dave’s, Corky’s and indeed Smokey Bones, have all failed in this market, and Sonny’s seems to have closed as many stores as they’ve opened. On the other hand, Melissa Cookston, the owner of this restaurant, has a very small-growth approach to her chain. The Atlanta store is only the third, and while she is considering a fourth and looking at spaces around the southeast, right now her focus is on this market. Cookston, the author of Smokin’ in the Boys’ Room, is a Mississippi native who has been on the competition barbecue circuit for eighteen hugely successful years, including a couple of world titles to her credit, and she was last year’s whole hog champion at Memphis in May. She opened her first Memphis BBQ Company location in her home town of Horn Lake MS in 2011, using the former home of a Roadhouse Grill and setting the tone for the size and style of restaurant that she wanted to run. The restaurant was an immediate success, and attracted the attention of the Diners, Drive-Ins and Dives producers before the parking lot pavement was dry. Their host was especially taken with a cheese fritter appetizer. Horn Lake is, in census terms, part of the Memphis metropolitan area, and, leaving Memphis on I-55/I-69, it’s the second exit south of the state line. So Cookston grew up eating a lot of barbecue in one of the nation’s best barbecue cities. It’s home to two of my personal top ten: Leonard’s and the Bar-B-Q Shop. We had the pleasure of meeting Cookston and hearing some of her stories. She grew up favoring a small chain that was around at the time called Gridley’s. Only one location of Gridley’s still exists. I suggested that our host check out a terrific blog called Memphis Que, as I recalled that they had done a story about it (and indeed they did), but the sadly defunct My BBQ Blog also wrote about Gridley’s interesting history. It’s worth mentioning and linking to these here, because the story of Memphis barbecue, generally, is a fascinating one, full of ups and downs and chains that didn’t make it. Memphis BBQ Company’s own story might be a pretty fascinating one in the future. After a couple of years getting attention for her store in Horn Lake, Cookston hoped to open in North Carolina. She had become familiar with the Charlotte area after competing in shows there, but could not find a good location in that city for her second store. So she moved further east, to Fayetteville NC. That’s not a town that’s known for barbecue, although the state itself certainly is; even my friends the Barbecue Bros were stumped for a suggestion in Fayetteville when I drove up I-95 last year, so I bypassed it entirely. So with a captive audience of Fort Bragg soldiers hungry for good pulled pork and ribs, this store also became a hit, and Atlanta looked like a perfect place to set up between the two. 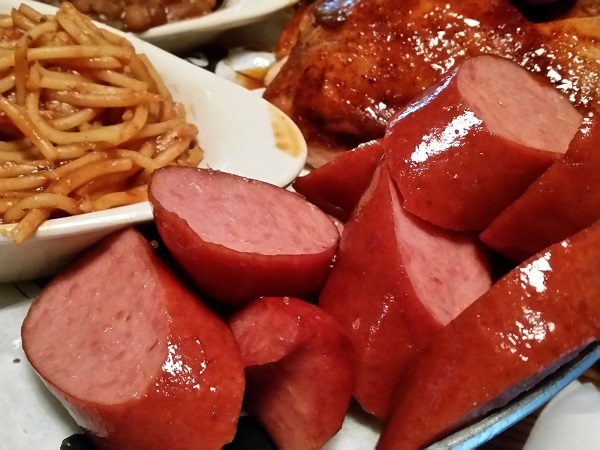 Other standouts that we sampled included the sausage and the brisket. Cookston did not seem particularly aware of the ins-and-outs of Atlanta’s barbecue traditions and history, and how one or two of us have been noticing that the quality of the beef available in barbecue joints has been improving over the years, and in many cases outshining the quality of the pork. That’s what happened here This is very, very good brisket. The ribs – both spare and baby back are available – were also pretty good, but the pulled pork was very bland, and the only sour note of the evening. The meats are smoked in an indoor room in a pair of Southern Prides, using pecan wood. I would definitely recommend ordering them dry. The sauce is a traditionally thick and sweet Memphis style, but the meats’ smoke flavor is very gentle, and the sauce easily overpowers it. I did like the ribs, but I am sure that I would have enjoyed them even more without the sauce. Cookston told us that she believes it takes about a year to get each location up and running and producing meals of the quality that it should. So it’s been deliberately under the radar as she continued to train staff and chefs while under a constant shuttle between Horn Lake and Fayetteville. I like the hands-on approach and wish her well. I hope that the store does well enough for Cookston to relax her schedule just a little bit and give her the chance to explore Atlanta’s own barbecue traditions. We have a lot to offer, you know. Maybe not quite as much as Memphis, but some of our local restaurants are pretty darn awesome. Are you planning a barbecue road trip? 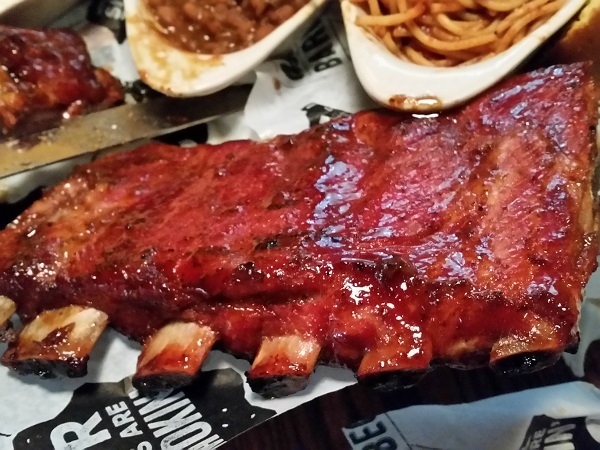 You can see all the barbecue restaurants that we have visited for our blog (more than 350 !) on this map, with links back to the original blog posts! Posted on October 26, 2015 July 15, 2016 by Grant G.Posted in atlanta, barbecue, georgia, regional chainsTagged atlanta, barbecue, dunwoody, regional chains. 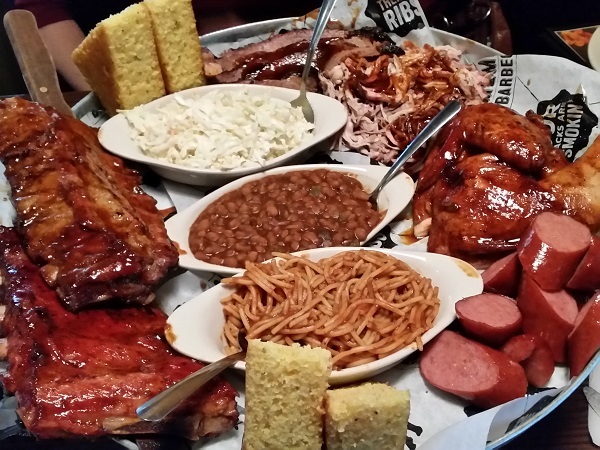 An excellent-looking plate of BBQ. Going to have to check this one out. I think you’ll find the brisket considerably better than what you found at the Swallow! Interesting that Cookston was originally looking at Charlotte for a location but couldn’t find the right place. I always did wonder why she chose Fayettenam. I think anybody at Ft Bragg originally from west Tennessee just loves having her place there, because it’s a little piece of home – same with people from New Jersey / Connecticut stationed there who want to have a “Giant Jersey Sub” from Baldinos! Ah, Baldino’s. You’re bringing back some old memories – I (Monk) spent a few years growing up there from the ages of 4-11. No kidding! There’s a Baldinos one exit south of us; I have a Sicilian about once a month.